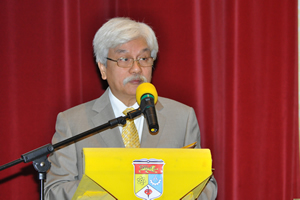 KUALA LUMPUR, 1 June 2012 – Without the sacrifices and resolve of the earlier members of the Medical Faculty, the achievements of today will not be possible said the Chancellor of The National University of Malaysia (UKM) . “We have to strengthen the core of tradition and values, modernization without the guidance of religious values and tradition, will make any progress fragile and unsustainable”. The Medical faculty started with a very humble beginning but with a noble intention. 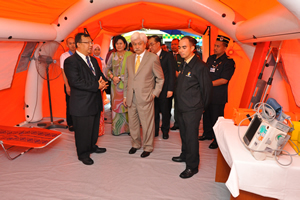 The objective was to produce enough doctors for the community. But after 40 years of its establishment the Medical Faculty with its Medical center is not just producing doctors within the border of this country. He reminded that in facing global demands the faculty must be firm on the values and tradition that have made to what it is now. The faculty started its operation 40 years ago from a house with Dr Amir Abas as the dean, since then it has made many world class historic achievements in various field of medicine from key hole surgery to tissue engineering. Soon the faculty will open the Advance Surgical Skills Centre to train doctors in the region in minimally invasive surgery techniques. 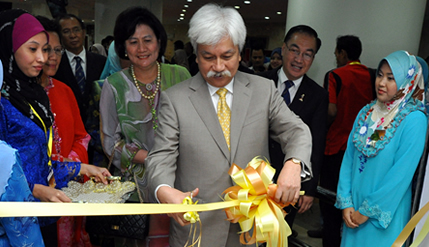 The Faculty is poised to be a center of medical reference in the region. When it first started the objective is to train doctors locally and now, it is expanding its role from training doctors in the country to training doctors in the region. 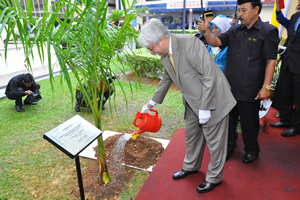 Present at the event was, Tunku Ampuan Besar Negeri Sembilan Tuanku Aisyah Rohani Tengku Mahmud, Prof Tan Sri Sharifah Hapsah Syed Hasan Shahabuddin Vice Chancellor of UKM, Deputy Vice Chancellors, Dean of Faculties dan Head of Departments.